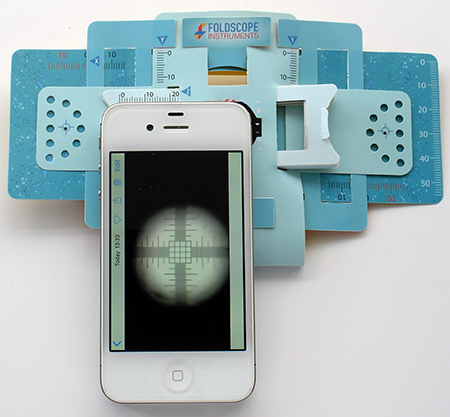 The Foldscope: Review II - 'Deluxe Individual Kit' - a first look. 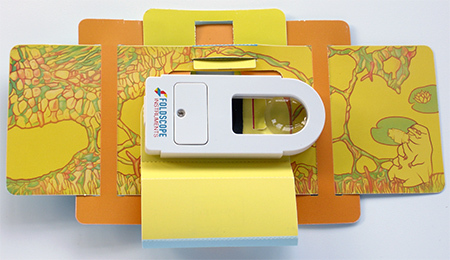 The Foldscope: 'Deluxe Individual Kit' - a first look. The Prakash Lab Foldscope co-invented by Manu Prakash and James Cybulski at Stanford University will be familiar to many readers. The lab has developed and produced in-house a sub-$1 microscope based on single lenses and folded paper for both educational and potential diagnostic uses. The project has received very wide publicity and thousands of users worldwide have being exploring free 'beta trial' examples distributed from 2014. The Foldscope 'Microcosmos' website for users illustrates the impressive breadth of subjects to which the Foldscopes have been applied to date including by young children, students, hobbyists, teachers and research workers. A 'beta trial' kit was kindly sent by the Prakash Lab to my colleague Mol and I reviewed this kit, primarily from an optical performance viewpoint which was shared on Micscape in December 2016. In November 2016 the Prakash Lab instigated a Kickstarter Project (goal $50 000) to fulfil the next step of the Project's aims for manufacturing and distributing a comprehensive Foldscope kit. The enthusiasm for the project is reflected in that their goal was realised in less than 24 hours and the final monies raised was $393 358. I pledged $29 for a 'Deluxe Individual Kit' ($15 + $14 for worldwide shipping). Regular project updates were received by email, including tracking number when my example was scheduled for delivery from China. This arrived in early November 2017 and many fellow project supporters have or will shortly receive their examples (individual and classroom kits were offered). 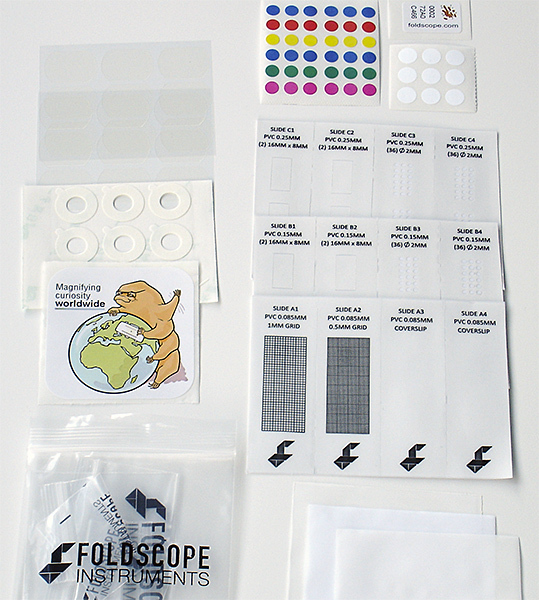 This 'First look' primarily illustrates the kit and the new Foldscope design. The kit is enclosed in a very attractively presented metal box (ca. 22.5 x 11 x 3 cm) illustrated with embossed examples of the macro and micro world that awaits to be explored. A covering welcome letter and obligatory safety notice is included. Ages of 8+ are advised. The top tray of the kit is shown and each item recess is labelled. The well plate splits to give a square 'Petri' dish. Two 140X mounted lenses are included with magnetic couplers. A variety of sample handling, preparation and inspection accessories are included. Two coarse strainers with stated 0.3 / 1.5 mm mesh are nested. Two prepared slides (stained fern rhizome and skeletal muscle l/s) plus three blank standard 3 x 1 inch slides are supplied. Additional slides are made with the pre-cut card and clear sheet supplied. A pointed cotton swab on a stick is below the tweezers for lens cleaning. Under the top tray is an attractive 'My Foldscope Journal' with an illustrated basic field guide to common macro / microorganisms on the inside covers. 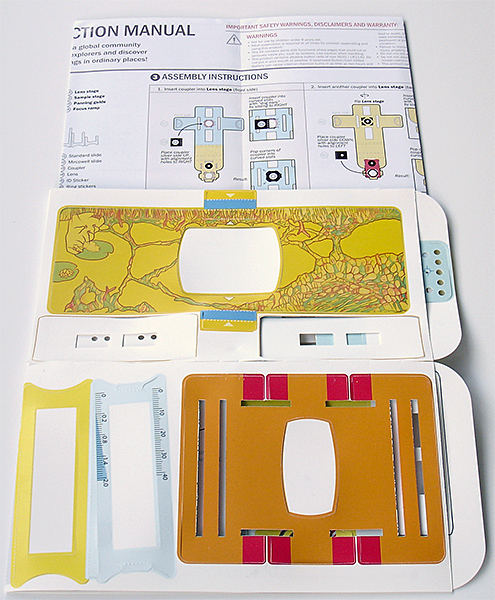 The Foldscope with assembly instructions are underneath, plus further sample accessories which are illustrated below. 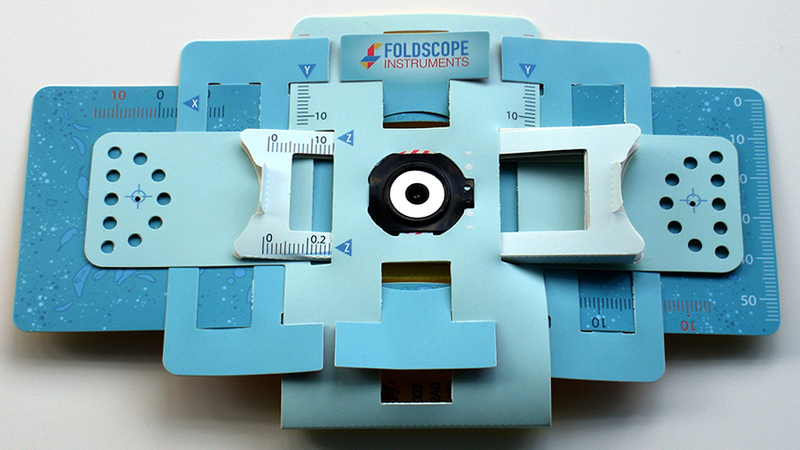 The Foldscope as for the beta design is presented on a single sheet with precut components. The Instruction Manual is now presented in colour so more engaging; some sample preparation and study advice is also offered on this sheet, especially for the popular collection and study of tardigrades. A variety of items associated with sample filtering, slide preparation and labelling are included. Three fine filter sheets are included at 5, 25 and 100 micron mesh. To use each filter it is suggested that it's folded into a cone and held over a sample container. Each Foldscope, as before has a unique label code. The double sided rings are for attaching the lens to the Foldscope and a magnetic coupler to a phone. 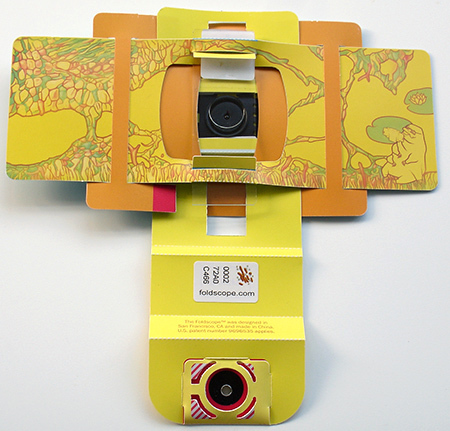 The Foldscope has been completely redesigned with the Project noting that it is easier to assemble. The construction material remains the thin but tough waterproof card. The trial version wasn't difficult to assemble but the new design uses simpler construction. A new feature is the provision of focussing which should ease use, especially with a phone camera as the focus is now held using a simple wedge focus. Assembled Foldscope from above. The X, Y and Z axis can now controlled with coordinates read off for an area of subject interest. The Focus wedge is shown near the focus point (typically 0.50 mm for prepared slides supplied) and can be read off on the lower Z scale (sub-units above 0.2 are 0.06 mm). The X/Y coordinates will only be valid for that session with a slide as slide entry isn't locked with respect to the X and Y axes as with the mechanical stage of a compound microscope. The single 140X spherical lens is supplied with stated resolution of 1.9 microns; the same as supplied with the trial version. The higher mag 430X lens offered with some trial kits is sensibly not included as this is arguably too tricky to use for educational use (see earlier Micscape article). 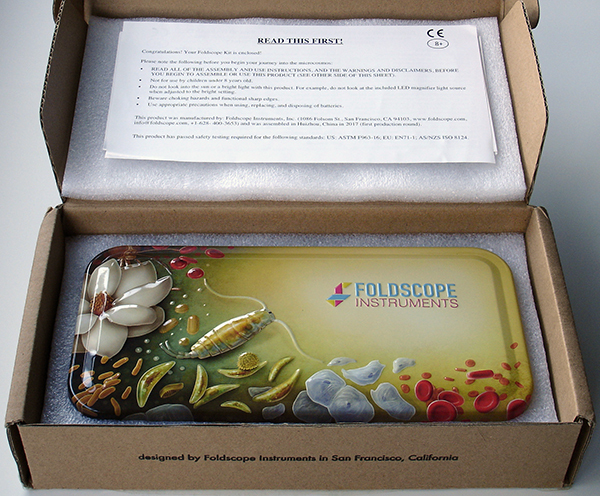 Foldscope from behind. A slide is inserted vertically into the two slots and magnetic coupler put back, as shown right (prepared slide shown inserted in left hand view). Slide insertion can be quite tricky initially and requires care until the slots have widened a little. Long term use should show if the thin strips of card are prone to wear with extensive use of glass slides. The rear magnetic coupler is important to hold the card above and below a slide for the focus wedge to work correctly. The handheld magnifier supplied is well made and has stated magnifications of 3X on the flat area to the right and 10X with the left hand lens. The 10X lens is used closer to the eye and gives a superior image than that from the camera further away which adds geometrical distortion. A battery operated LED light with two intensities is built in. 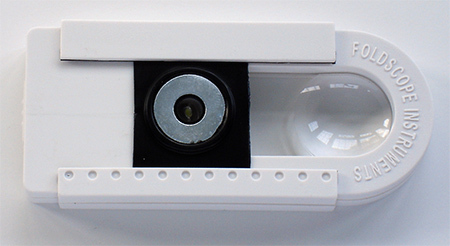 A slot on the underside allows one of the magnetic couplers to be slipped in over the LED light to allow use as portable light on the Foldscope as shown. 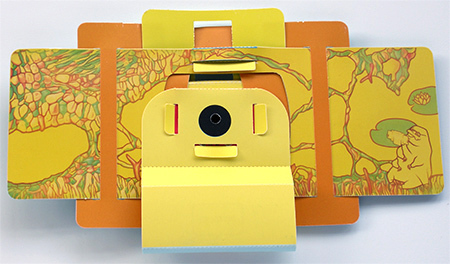 This unit can also be used for image projection with the Foldscope as described on the manual sheet. The recessed LED may be amenable to some small filters e.g. a polariser and perhaps even monochromatic filters for autofluorescence studies (with appropriate filters on the uppermost side of the lens); two aspects I hope to try. The LED optical axis is at an angle to the lens axis so experiments with variable oblique to improve contrast with suitable subjects may also be explored. A lot of thought has clearly gone into the design, presentation and contents of this commercial kit. The new design is simpler than the beta version and has the ability to set and hold focus. The kit allows users to learn about a variety of sample collection, isolation and preparation techniques for observation both at low and high power and also some quantitative studies. The user of any age, but particularly the young / young at heart with no previous access to the world of macro / microscopy, I suspect will be delighted with it and the many explorations it offers at such modest cost. The instruction sheet notes that the Foldscope is subject to a 36 page extensively illustrated US Patent No. 9,696,535 published on July 4th 2017. Of course, the established naturalist or microscopist fortunate to have the funds to support their interests with commercial lab and/or field scopes may on first choice adopt conventional, higher performance and easier to use outfits ... but the kit is not primarily aimed at that user. Although even an established microscope user I suspect would be hard pressed to assemble so efficiently such a good value and compact field macro / microscope system for collection / inspection / imagery of macro and microorganisms. The Prakash Lab are a small university based team and it's most impressive that the team have been able to overcome the no doubt considerable scale up challenges but still be heavily involved on the personal level. The latest update email dated November 10th 2017 notes that 18 tonnes of products have been made and shipped from the manufacturing facility which they set up in China. Foldscope sets using the new design for both the individual and classroom can be 'Pre-Ordered' on the Foldscope website e.g. for those who did not participate in the Kickstarter pledge. The Deluxe Individual Kit above is now priced at $25 + $4-99 international shipping. Published in the November 2017 edition of Micscape.